You are here: Home / Obituaries / Joseph F. Kabrhel, Jr.
Joseph F. Kabrhel, Jr., 67, of Lancaster, formerly of East Stroudsburg, passed away Monday, July 9, 2012 at the Mennonite Home in Lancaster. Born in Philadelphia, he was the son of the late Joseph F. Sr. and Julia Barta Kabrhel. He was married for 44 years to Susan Linton Kabrhel. 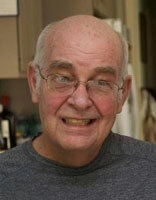 Joe worked as a Industrial Arts teacher for the East Stroudsburg School District, retiring in 2001. As an Eagle Scout, he was active with his sons in the Boy Scouts of America. He built his own workshop in his Lancaster basement, where he enjoyed carpentry and woodworking. A farmer at heart, he spent many hours in his gardens, planting flowers and growing vegetables. He also enjoyed model railroading. In addition to his wife, he is survived by 2 sons, Stephen, husband of Jessica Kabrhel of Baltimore, James, husband of Amy Kabrhel of Wisconsin, and a grandson, Nathan Kabrhel. A memorial service will be held from Kearney A. Snyder Funeral Home 141 E. Orange St. Lancaster, PA on Saturday, July 14, 2012 at 3 PM. The family will visit with friends from 2 to 3 PM at the funeral home on Saturday. In lieu of flowers, contributions may be sent to the American Heart Association 610 Community Way Lancaster, PA 17603 or to the Alzheimer’s Disease Association 3544 N. Progress Ave., Suite 205 Harrisburg, PA 17110-9638. Offer Condolence for the family of Joseph F. Kabrhel, Jr.
Our sincere sympathies to you, Sue, Stephen, and Jim, and to your families as well. We have many fond memories of Scouting adventures with Joe. As time helps you heal, may all the good times you’ve had together bring you comfort and joy. Sue, Bob and I are so very sorry to learn of Joe’s passing, too early in life. I hope that, in time, your warm memories and family will bring you peace of heart. I am away, writing on my laptop,and wanted you to know I have such fond memories of both of you! My prayers go out to you! I remember Mr. Kabrhel from East Stroudsburg PA and his love for what he did at the school. Great man! A great man and a great family. You will always be in my heart, mind and prayers. Sue, I am so sorry to hear of your loss. My thoughts are with you and your family at this time of sorrow. Take comfort in the fact that Joe is now walking with the Lord. We are sorry to hear about Joe. Our thoughts and prayers are with your family. Take care of yourself. Joe was my mentor, without his input I would have met with less success. Joe Kabrhel will be a name I will always hold close. Our prayers are with Sue and Steve and James and their families. We know there are deep, deep waters when a loved one passes. We were so honored and blessed to have met this wonderful wonderful man at Steve’s wedding. Memories of Joe’s warm smile and joyful laugh will be with us always. Know we are holding you all in our hearts and wishing you deep peace. Dear Sue: Our thoughts and prayers are with you and your family. Joe touched many lives of young people and he was sincerely dedicated to his family and his profession. Bill enjoyed talking to him about college and Nancy will not forget the good times at J.M. Hill with you. We know that your loss is deep and we are praying for all of you. Joe holds a very special place in our hearts he will always be loved and missed by us and everyone who knew him. I was sorry to read of Joe’s passing. It really got me to thinking about the days our group got together in each other’s homes when we were young. I enjoyed looking at photos in my album again. I recalled when Joe installed the siding on our house which was supplied by your dad’s company. It’s still in good shape. And I’m glad to have the stereo cabinet that Joe made. I’ve had to replace the stereo equipment, but the cabinet is still in the living room. I’m glad to have it as a reminder of Joe. If you’re inclined, I’d love to hear from you and catch up. I’m still in Erdenheim. Be assured that you’re in my thoughts and prayers, and please share my sentiments with your family. Just heard about Joe’s passing from my Aunt MaryAnn. I’m so sorry. We’ll be thinking about you during this difficult time.